How Many Calories Are in a Macintosh Apple? Sodium is prevalent in many types of food, and unless you're careful about what you eat, it's easy to consume too much of the mineral. The American Heart Association suggests that you consume no more than 1,500 milligrams of sodium daily. Enjoying an apple a day, however, will hardly boost your sodium intake. 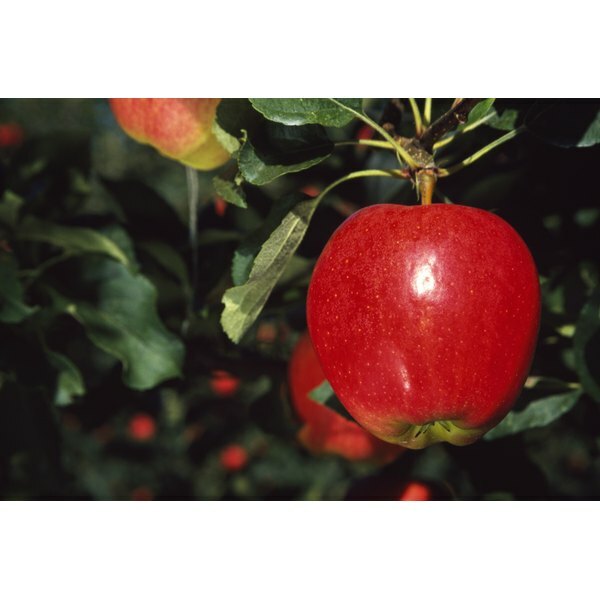 What little sodium there is in an apple is found in the fruit's skin, according to the U.S. Department of Agriculture. An unpeeled, 3-inch diameter apple has just 2 milligrams of sodium. When peeled, the same size of apple doesn't contain any sodium. With its skin, a 3-inch apple has 95 calories, 25 grams of carbs, 4 grams of fiber and 8.4 milligrams of vitamin C. The sodium content of apples doesn't differ significantly among varieties.